Commonly used in reef tanks, activated carbon is great for a whole variety of reasons, ranging for removal of general contaminants, dissolved organics, undesirable odors, yellowing pigments in the water, removing the build-up of toxins that corals and algae emit to fight each other, and much more. Other than manual removal via water changes, we would say the number one reason reefers use activated carbon is to remove yellowing pigments in the water. Water coloration is both a visual indicator of pollution building up in the water, but also make the corals drabber and can quickly reduce the overall power transfer from the light to the bottom of the tank by 30% or more. You may not think your water is yellow, but the best time to notice is actually when the lights are out the water should be crystal clear with near zero yellow tinting. Even better next time you do a water change fill up a bucket with a white bottom, and you'll see precisely how yellow water may be. It should be a crystal-clear with any color being present being a slight blue tint. Shortly after running some carbon you can clean up the dirtiest of water and return it to that crystal blue state, but we also recommend using carbon as a general backup insurance against the accidental introduction of undesirable contaminants. Your reef tank can pick stuff up from almost anywhere such as your hands, broken down or failed equipment, or any other time something from outside is introduced. Anytime you may suspect or know something is not right with the tank, corals look angry, polyps not out, receding tissue, etc. changing out the carbon and attempting to remove any of the potential irritants is the first step we take towards solving any potential issues. There are three different types of carbon, Bituminous, Lignite, and ROX 0.8, though they all look somewhat similar, there can be some pretty significant differences between the different types of activated carbon. The most common carbon the aquarium industry uses because it's low cost hard and contains a pretty minimal amount of dusty fines which makes it easy to rinse and pretty user-friendly. However bituminous has a smaller average pore size, and it will have somewhat lower performance and the other options. Something that you can compensate for by using more BRS Bituminous Carbon is what we call a special grade bituminous because it's known for having a larger than average pore size than traditional bituminous carbons, making it both higher performance and most cost-effective. Bituminous is what we would recommend to anyone looking for an easy-to-use, low-cost solution. 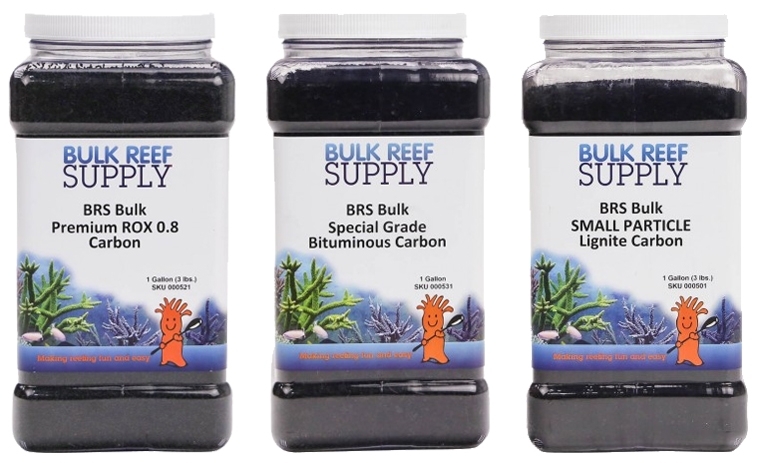 Lignite carbon is known for having a considerable average pore size which is ideal for large organic compounds and contaminants that are common in the reef tank. That said, there is a tradeoff for the network of predominantly large pores being a soft carbon which means it will have considerably more dusty fines and takes a bit more effort to rinse. If you use lignite in a reactor, flushing the unwanted fines out is quick and super easy. If you are using a filter bag, it can take a couple of minutes to get all those fines rinsed out, which may seem like an eternity if you're used to the ten seconds or so that many other types of carbon may take. This is particularly true of this smaller particle lignite carbon which we would suggest only to be used in a reactor because it is difficult to rinse in a filter bag. The BRS Small Particle Lignite is the highest performing of the two lignite carbons, because of the more accessible pore network and resulting surface area. The smaller particles will also significantly reduce water channeling around the carbon rather than through it and have increased performance. We would recommend lignite to reefers who want high-performance at an affordable price and willing to put in the bit of extra effort to use it. If you wanted to combine benefits of both bituminous and lignite carbon, the best carbon that we have found is ROX 0.8. It is a proprietary blend of a variety of different raw carbon materials which spans a wide range of pore sizes make it the most effective carbon on the widest range of contaminants. Even though it does come at a higher price point than bituminous or lignite, you can use much less so dollar-for-dollar it is just about the same. BRS ROX 0.8 is designed for use in pharmaceutical applications where it's critical that it performs the best at contaminant removal and meets the standard the high demand industry. It also can't add anything to of the water, because of that it's been washed and purified to meet those exacting needs. The carbon particles come in tiny little pellets, which are designed specifically for use in water purification applications. The small pellet size maximizes the amount of available surface area as well as reduces channeling. ROX 0.8 is also the hardest carbon we available in the aquarium industry, which means it rinses in a snap, through a reactor and even a filter socks rinse clean just a few seconds with near zero effort. If you can't tell already ROX 0.8 is the personal suggestion from every employee at Bulk Reef Supply. It's not just the best performing carbon, but also the easiest to use in a reactor or filter bag. It does cost a bit more, but a single gallon container will last most aquariums a year or more. Using carbon is super easy, and we always suggest starting small and working up to a full dose. We do have the Reef Calculator that can tell you exactly how much to use, but for ROX we suggest starting 1 tablespoon for every 10 gallons of tank water. For lignite carbon, we recommend 1.5 tablespoons per 10 gallons of water and two tablespoons per 10 gallons with bituminous carbon. Most reefers with a standard tank size will find themselves using anywhere between a half a cup and a cup and a half of carbon, so not a whole lot. The two conventional methods are using carbon is a simple filter sock and a reactor. The easiest and cheapest way to implement carbon is to throw the carbon in a mesh bag, rinse it until the water runs clear, and then throw it into a high flow area of the tank or sump. When rinsing make sure to let the water flow through the bag until it runs clear, don't attempt to wash it or grind it back and forth since that will create more dust to rinse. The filter bag is a cheapest in many ways the most straightforward solution but not the most efficient or effective. Using an up-flow reactor of some type where a pump actually forces the water through the media and cycles virtually every drop of water in the tank through it many times a day. A reactor is going to be much more efficient and yield better performance. When selecting your reactor, it is crucial to choose the one that has a method for holding the carbon in place, so it doesn't tumble around. Even though the simmering carbon may look cool, but also with the hardest of carbon they just grind against itself, creating more fines. Since there are only downsides to tumbling carbon, just don’t do it. The highest rated reactor we suggest is the BRS GFO & Carbon Reactor because the design allows for easy cleaning and media changes. Since the pump, hoses, and cords can stay put, just unscrew the canister and take it and the internal cartridge to the sink. 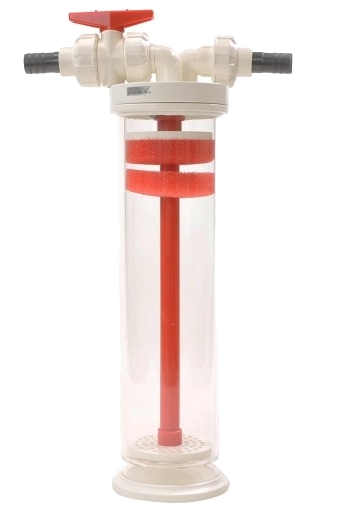 In most cases, the BRS Mini Reactor is probably large enough for carbon use alone, and the smaller cartridge holds the carbon in place, where the larger 10-inch reactor lets you slide the foam pad up to keep the carbon in place. If you're looking for a media reactor, which is a bit larger or with an acrylic design, we would recommend looking for something that can hold the carbon in place. One of the better options is the Vertex RX-U Reactor which has a sliding plate and can accommodate the exact amount of carbon that you want to use. Rinsing the carbon with any reactor is super easy, just remove the return line from the reactor, place it in a bucket, and turn the pump on until the water runs clear (which normally takes less than 30 seconds with almost any type of carbon). One the water starts to run clear, adjust the flow rate down to something pretty low. A steady stream is all you need, this isn't an exact science and because it is a closed system which is going to get many passes a day it just isn't that critical that you get the flow rate perfect. Slower flow rates with carbon means more contact time and better performance and less detritus in the reactor which are all benefits. Carbon maintenance is pretty simple; you just need to change it out periodically. Regardless of what any manufacturer says activated carbon in a reef tank actually doesn't last all that long. The carbon itself has a tremendous potential to capture and remove a wealth of contaminants over an extended period in a reef tank the outer pore structure often gets clogged quickly with detritus and bacteria, which makes the inner pore structure unavailable fairly rapidly. The lion's share of carbon’s effectiveness will be in the first week, but we suggest replacing it every couple weeks or when you perform other elements of general maintenance. You can let it go as long as a month between changes but it probably isn't doing a lot towards the end and you'll likely be some organic build-up. For that reason, you may want to use slightly more than we suggest if you're going to change the media out less frequently.